Factors Influencing the Implementation of Educational Innovation. 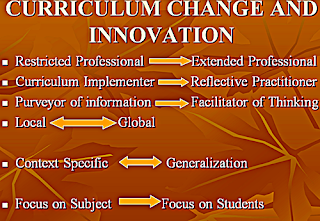 Curriculum innovation is about making change through conscious intervention at all the three levels of the curriculum: approaches, subject matters and values. Because the curriculum changes brought about by innovation relate is not just to the way people behave, but also to the way of their think about certain issues, such changes will not always be quantitative, they could also be qualitative (Kennedy, 1988). The management of a project requires, in addition to skills in the organization and administration of material resources, considerable expertise in the management of change. The Diffusion of innovation researchers generally agree that the effective planning is crucial if a implementation effort is to meet with success. The planning would be deliberated, determinatived, collaboratived, future oriented and structural (Michaletz, (1985 as referenced in Henrichsen, 1989). Bringing about educational change is often a long, complex, anxiety and conflict-ridden operation with unforeseeable obstacles and problems (Fullan, 1982). This is because any innovation is part of several interacting systems and sub-systems and areas which at first sight appear to have a little to do with the innovation itself. It can begin to have considerable influence on the degree of acceptance of the innovation (Kennedy, 1987). It is becoming increasingly evident that change efforts across cultural boundaries, compatibility with the culture of the host country can be a decisive factor and cannot be taken for granted. Compatibility involves the degree to which potential adopters feel an innovation is ‘consistent with their existing values and past experiences’ Henrichsen, (1989). In addition Henrichsen suggests that the are two types of compatibility are necessary: (i) compatibility between the innovation and its intended users, and (ii) compatibility between the resource system and the intended of user system. Potential mismatches between these components would be spotted and promptly. White, observes that however beneficial an educational innovation might appear to its creators, the values and history of the surrounding culture would be a serious consideration before moving forward with reforms. There is virtually unanimous agreement that an educational system is essentially an organic outgrowth of the society's unique history and the culture (Beauchamp, 1986, as referenced in Henrichsen, 1989). Hence, as Henrichsen rightly points out, this history and culture must be the background against which reforms must be attempted and the foundations upon which change campaigns must build. For one thing, the prevailing educational philosophy of the host institution or country—whether egalitarian or elitist, authoritarian or participatory, product-oriented or favoring process, knowledge- or skills-oriented, encouraging of learner, and it will strongly influence the implementation (Maley, 1984:92). In addition, in many Asian countries, the pressures of examinations, which form a powerful instrument of the education system, can facilitate or hinder change. Morris:1985, (as referenced in Karavas-Doukas, 1998:41) provides an account of secondary school teachers in Hong Kong who rejected an innovation emphasizing a heuristic style of learning process despite expressing favorable attitudes towards it because the new approach did not enable teachers to cover the examanition based on syllabus. Teachers realized that the new approach to be wholly dysfunctional because it required them to ignore the expectations of their pupils, principals and colleagues. The basic aim of all educational innovation is to bring the improvement in classroom practice and enhance student learning. However, in cross-cultural efforts at innovation, it cannot be assumed that students will accept a foreign innovation unquestioningly or feel comfortable using it if it does not fit in with their 'learning style' (Henrichsen, 1989:90-91). Based on his experience of Asian classrooms, Maley presents that, the most common profile of learner expectations' as follows: "learners who expect the teacher to take a preponderant role in the classroom, who expect to have a book and to learn it, who believe that there must be one best method to used which will magically (and unrealistically rapidly) bring them up to the highest level of competence, who will expect to work long hours out of class but in rather traditional memorization modes, and who may expect a very different program content from the one they are offered" (Maley, 1984:95). Similarly, while teachers are a key factor of the successful implementation of educational change, they are known to have established, well-entrenched beliefs about the teaching and learning performing and the roles of teachers and learners in the classroom. These beliefs or 'theories' guide their judgments, interpretation and classroom behavior. If any incongruity exists between the innovation project's philosophy and the teacher's theories, the teacher will tend to interpret a new information in the light of their existing theories and will tend to translate innovatory ideas to conform to their existing practice. Teacher resistance can thus form a major barrier to educational innovation. It seems a highly demanding set of expectations to pass trough the innovation problems beside to educate the teachers, such as large classes, overload, lack of time and material resources, lack of institutional and infrastructural support, and so on. This is true particularly of teachers working in many Asian and South East Asian contexts. Kennedy, C. (1987). 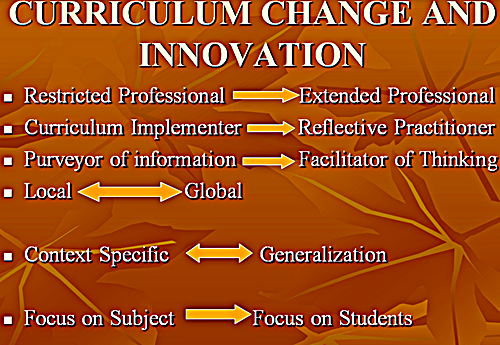 Innovations for a Change: Teacher Development and Innovation. ELT Journal, 41 (3), 163-70. Kennedy, C. (1988). Evaluation of The Management of Change in ELT projects. Applied Linguistics, 9 (4), 329-42. Henrichsen, L. E. (1989). Diffusion of Innovations in English Language Teaching: The ELEC effort in Japan, 1956-1968. New York: Greenwood Press. Fullan, M (1982). The Meaning of Educational Change. New York: Teachers' College Press. Maley, A (1984). Constraints-based Syllabuses. In J.A.S. Read (Ed. ), Trends in language syllabuses design. RELC Anthology Series 13, Singapore: SEAMEO Regional Language Centre.